To be sure he only makes passing reference to limits to growth. I think those greatly complicate the situation. But Lanier’s key point about money is, um, right on the money. Between smothering bureaucracy and cruel neglect, there stands only one possibility: a functional middle class. And for this to happen, bespoke creative work has to be valued. There is no limit to the amount of art we can produce OR consume. We may be at the beginning of an immensely creative era, but only if we agree to monetize creativity. How to do this requires some careful thought. The idea that we are all in the midst of an endless apprenticeship (while traditional commercial and industrial modalities vanish all around us) doesn’t scale. But I think we have to let go of growth, or many other things break. So that complicates the job; real things cannot constitute a vanishingly small part of the economy in any way that is stable. Else, you end up with a tulip crisis, of course. Somehow this all has to be balanced, growth gradually and smoothly ended, fairly soon in the richer countries; somehow all the global constraints have to be fed into the incentive systems too. Nothing resembling government today is competent to do these things. But I don’t see how we manage without burning new constraints into the system. It’s going to be enormously hard to even get people to understand the spectrum of possibilities. This applies to our collective vision of the future. People are selecting from a profoundly demoralizing pair of implicit competing visions (universal poverty on the left; militarized wealth in a sea of poverty on the right, both in a diminished, biologically depleted world). We need to create a shared vision of a future that is something other than extrapolation, something other than a more comfortable car to be stuck in traffic in, something other than shabby and grim and dehumanizing. But most of our customers, that is, the people who need to buy into some new more inspiring vision, are mostly stuck in their day to day problems and just want strategies to see them through the week, not the century. We must ask people for a lot of thought and a lot of effort and some sacrifices. We cannot succeed without a positive vision of the future, something that no political party anywhere is offering in any credible way at this time. I disagree that "Lanier then claims that “There are only a tiny handful of writers or musicians who actually make a living in the new utopia [of demonetized sharing].” I once did a study a year or so where I found that there were more albums released by artists that were available in 2008, than in all of the 1960’s. So much for a handful. The internet has created an open environment where anyone can release music not just the handful that record execs deem good enough." even addresses the point. That article is an emotional response, not an engagement with his ideas.As far as I understand from the video, the point is NOT how much creative output is available, it is whether that creativity is useful economic activity for the people producing it. The point is that we still have a star system insofar as economic reward goes, even as we somewhat succeed in a fabric of distributed creativity.And since I myself have not really thrived under a star system I am very interested in increasing thriving potential for the long tail.I also think Scott McCloud's arguments in favor of microstransactions in "Understanding Comics" makes the same point.We may be experiencing a burst of creativity, but we need a reward infrastructure. The difference between getting nothing and getting a dime for each enthusiastic read is only a dime for the reader, but it is potentially life-changing and liberating for the author. This is the marketplace as it should be. It's profoundly anti-oligarchy, and I don't understand the objection. Sociopaths are glib – they know how to present very well – it SOUNDS good and humanistic but it depends on the same old market magic pixy dust as always. I'm simply tying what he says into his overall advocacy history and ideology. 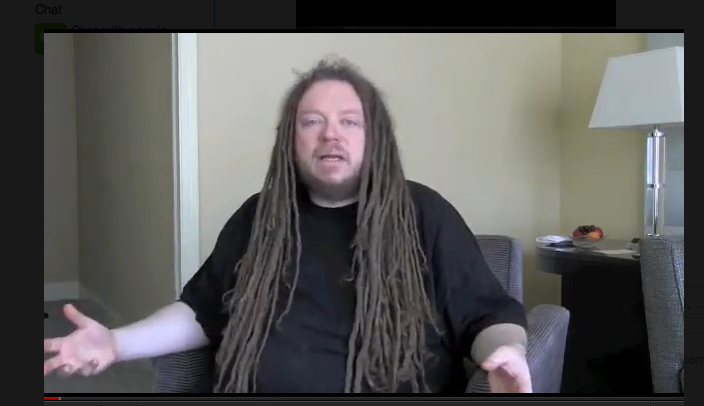 He does have one, and it's discoverable, here's just one take: http://www.digitalfrontiersuf.com/2010/03/jaron-lanier-is-a-capitalist-stalin-and-oh-ya-the-internet-rules/His brand of hyper-propertarianism is to inconvenient science what religious fundamentalism is to evolutionary biology. The source of the problem and not the solutions.Moreover, he is simply ripping off Clifford Stoll's earlier writings lately, which is the other half of why I try to give more information when people glorify him. Albert Ellis covered this very well. Marion, the argument is obviously pragmatic, utilitarian and respectful of life and liberty. That he doesn't end up where I do doesn't make him my enemy, and it shouldn't make him yours that he doesn't end up where you do. Yet another sociopathic market fundie you're uncritically following, Michael. This one is even demonstrably stupid. Did you even research him? His soi-disant best idea anyone ever had was for the entire (government-created) internet to be so regulated by propertarians like him that ONLY ONE COPY OF ANY FILE – music, video, photo – would be allowed to exist on the entire network.He's a lot like Eric Raymond, too – a self-praising parasite. His claims of pioneership in the VR world are paper thin. At least Stewart Brand, for all his patent dishonesty, was a person of some real accomplishment, dating back to Doug Englebart's demonstration. I don't understand what a global overall "borrowing from the future" could mean in any physical sense. Maybe you have something specific in mind?With monetary debt every loan has two sides: the borrower and the lender. There is a promise that the borrower will pay back the loan – with interest, so that's a promise of future exchange, a commitment by the borrower to redirect some of his future income to the lender. But there is no physical constraint involved: it is merely a contractual obligation between borrower and lender, and can be broken under various conditions without any fundamental damage to the world.I believe the old Hebrew law involved complete forgiveness of debt every 50 years, in a jubilee year. Large developing nation debt has often been forgiven or greatly reduced. On the other hand, high interest rates can greatly compound original debt as many credit-card holders discover, giving large future obligations to lenders based on almost a whim.Overall, at the global macroeconomic level, all debt must cancel out at every point in time. So the system as a whole imposes no obligation on the future monetarily.What we bequeath to the future is what we build today, minus that which we consume or destroy. If we build things of value and limit our destruction, we enrich the future. If we build things of little value and destroy much, we impoverish the future. But in neither case does it seem to me there's any obligation of the future in relation to monetary debt. While I don't agree with full employment as a workable or useful goal going forward, I do agree that there is a whole raft of civil engineering type projects to do, and the implementation ought to employ lots of people.That we aren't doing this as a stopgap is something a lot of people are worried about. Here we get into the parts of economics that confuse me. But to the extent that deficit financing really is borrowing from the future I think we really can no longer afford it, because we really cannot expect growth into the future. Running up a credit card bill when your income is in decline is not such a good idea.The US, specifically, has a great deal of room to manoeuvre (I can never remember how to spell that in English) though, because the tax rates on the wealthy are so low. So in the special case of the US, yes, I am for going all out on new infrastructure provided the taxes are reinstated to historical levels.But NOT because it creates full employment, even if it does so for a while. Because in the end, full employment in the sense we are used to it doesn't work. Arthur, specifically construction and mass retail jobs are suddenly superfluous. Retail because of, well, Amazon. Commercial construction because of Amazon as well. And residential construction because houses were overbuilt because of policies in the recent past meant to sustain employment but which essentially borrowed employment from the then-future now-present. And while I'm most familiar with this in America my sense is it has happened elsewhere as well.These are enormous sectors especially from the employment point of view.Eventually the residential construction may recover but not for a long time, especially if some of the excess commercial buildings are converted to housing.I'll change the title but I'm stuck with the URL. Apologies to Lanier if he happens by. MT – it's "Jaron", not "Jason".I've long thought something similar – I remember deciding many years back that with automation, any type of work that employs order(N) people (N = human population) has to eventually be doomed. Only the order(1) or perhaps order log(N) jobs can survive in the long run.Now, some jobs embody components of both; sometimes it's hard to tell. For instance, service jobs involve catering to specific other people or in a specific place, so in the sense that each person or place is unique (as they will be when each person is doing order(1) work), service can itself be order(1).But anything where the work is absolutely routine and not specific to the individual "customer" or place is not likely to survive. Manufacturing and farming jobs have been going away for a long time.Routine office work has risen but I think is now on the way out too – in most places the computers take care of "paper-pushing", and humans are needed for specific unique instance-based decision-making. Health care has been growing in employment because every patient is unique at least the way we handle things now – I suspect at least some of that is ripe for revolution soon as commonalities between patient conditions and responses become clearer through genetic analysis and other advances.Education has been one of the slowest to have any sign of reform. To the extent teachers are just founts of information they can be easily replaced. But each students learning process still seems unique, and any interaction with that uniqueness in the teaching process makes teaching an Order(1) job – for now.Luckily for most of us the transition seems to be generally pretty slow, but there are occasional periods of intense disruption. I'm not sure the present slump is at all related to this phenomenon though – only the revolution in routine office work, if anything, is relevant at the moment.